The Oyster Recovery Partnership (ORP) is hosting another fun oyster-shucking workshop in its Shuck Like a Pro series, and this one may have the coolest venue yet. This Saturday, October 21, ORP will hold two one-hour sessions at Sandlot, led by Orchard Point Oyster Company owner, and Chesapeake Bay native, Scott Budden. Sandlot is an outdoor beach restaurant with seating, bocce and volleyball courts, and a large kids' play area, located in Southeast Baltimore's new Harbor Point development. For $30, those looking to learn or perfect the art of shucking will get six oysters, hands-on instruction, and gloves and a shucking knife to take home. 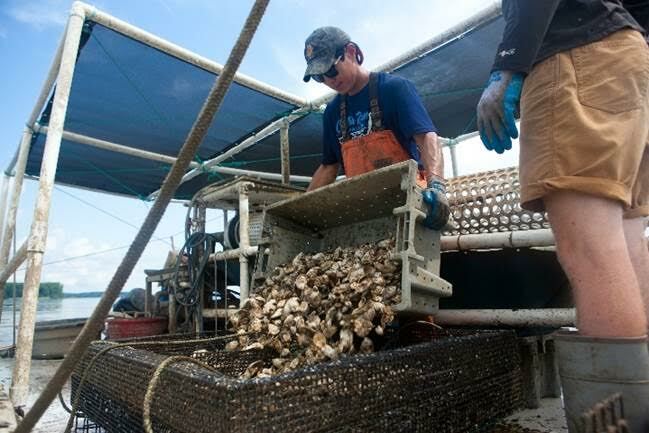 Guests will get to learn about a day in the life of an oyster farmer from Budden, and also how important recycled shells are for oyster restoration efforts. A percentage of each ticket will go to ORP, the region’s leading nonprofit dedicated to the large-scale restoration of oyster reefs in the Chesapeake Bay. For more information and tickets, click here. This Bay Bulletin writer was lucky enough to be around for another recent Shuck like a Pro event. To read about it, and watch a step-by-step shucking video from the experts, click here.